One dessert you can count on in most Spanish or Mexican restaurants is this classic caramel-flavored, sweet and silky vanilla custard. The perfect make-in-advance dessert, flan is a soothing, light finale to spicy foods, and, as an added bonus, it keeps for a few days in the refrigerator without losing freshness or flavor. Prepare the Caramel and coat a 9-inch round cake pan. Add the bean also and bring the milk to a boil. Remove the saucepan from the heat. Set aside to cool in the pan of water. Then remove from the water bath, cover with plastic wrap, and refrigerate at least 4 hours or overnight. To serve, run a knife along the inside edge of the pan and gently press the center of the bottom to loosen. Cover the pan with a platter, invert, and lift the pan off the flan. Cut the flan in wedges and serve topped with cold Caramel. Vanilla beans, the long, thin, dried, brown pods sold in the supermarket spice section, are the fermented pods of a Mexican or Tahitian yellow orchid. Look for pliability when purchasing. A good vanilla pod should be as flexible as a dried apricot. To release the bean’s essential oils and flavor, always split it lengthwise with the tip of a paring knife, and scrape the small brown seeds into whatever you’re infusing. Those tiny dark seeds are the speckles in “pure” vanilla ice cream. Their perfume is unmistakable — some even say it’s an aphrodisiac. 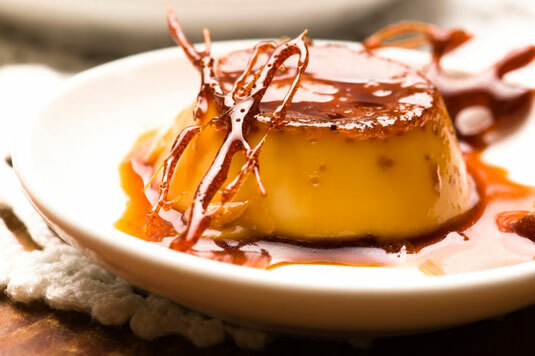 A truly great flan should have a luxuriously silky consistency and a rich caramel flavor that lingers on the tongue. To make the caramel, you want to cook the sugar slowly, a longer time than you suspect, and watch it carefully. The color should turn from light caramel to dark coffee, and the fragrance should be rich and very caramel-like. You can store leftover sauce in the refrigerator and thin it with some hot water the next day. Have ready a 9-inch round cake pan. Combine the sugar and 1⁄2 cup of the water in a medium saucepan. Cook over moderate heat, swirling the pan occasionally, until the color is dark brown and the mixture has a distinctive fragrance of caramel, about 15 minutes. Use a pastry brush dipped in cold water to wash down any sugar granules from the pot’s sides. Pour enough of the hot caramel into a 9-inch round cake pan to coat the bottom and sides. Swirl to coat evenly. Slowly and carefully add the remaining 3⁄4 cup water to the caramel in the saucepan. Bring to a boil and cook over moderate heat until the caramel dissolves, about 5 minutes. Occasionally stir and brush down the sides with the pastry brush dipped in cold water to prevent crystallization.